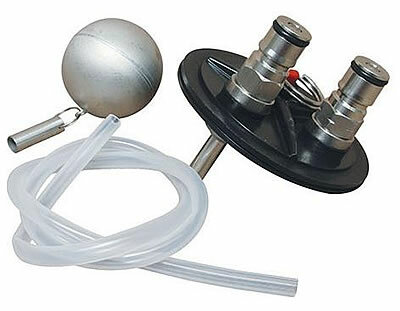 Optional Pressure Lid kit lets you pressurize your Fermentasaurus. Add the optional pressure lid and turn your Fermentasaurus into a true uni tank. Uni tanks are conical fermenters used both for fermentation and for carbonating and serving finished beer. The assembly includes a lid with two ball lock connect fittings, a relief valve, and a unique floating pick up tube. This pressure lid assembly turns the Fermentasaurus into the most unique fermenter on the market. Here are some possibilities. First one of the most intriguing uses is to ferment under pressure which reduces ester production and fusel alcohol production. That means that you can ferment warmer than you normally would, even making lagers at room temperature. Most commerical beer is fermented under pressure just due to the size of commercial tanks and the pressure that is created by the column of beer. When you are fermenting under pressure the beer is already carbonated when you are done fermenting. You can control the level of carbonation by using an Adjustable Relief Valve. You can use a Beer Line Assembly to sample at anytime. The idea is that the Fermentasauras can eliminate kegging and you can serve directly from the fermenter. We love this idea but there will probably still be times that you want to keg. Use a Keg Jumper line to connect the Fermentasauras to your keg and enjoy the easiest kegging experience ever. You can also choose to send carbonated beer through a Beer Filter on the way to your keg. When applying pressure with a CO2 tank also make sure that you have a functional relief valve on your CO2 regulator. Because the beer always has a CO2 blanket through fermentation and during any transfers out, oxidation is eliminated. When you cold crash you won't be sucking air back in through an airlock.